The brown of the mother-of-pearl coin bead in this bracelet is so rich looking – not deep or dark in color, just really rich. I’m thinking it has to do with the fabulous glisten on the mother-of-pearl itself. An ivory and brown swirly mother-of-pearl coin looks lovely, too. Freshwater baroque ringed pearls in a soft coco shade are the perfect complement. Beautiful gold-plate bead caps bring it all together. 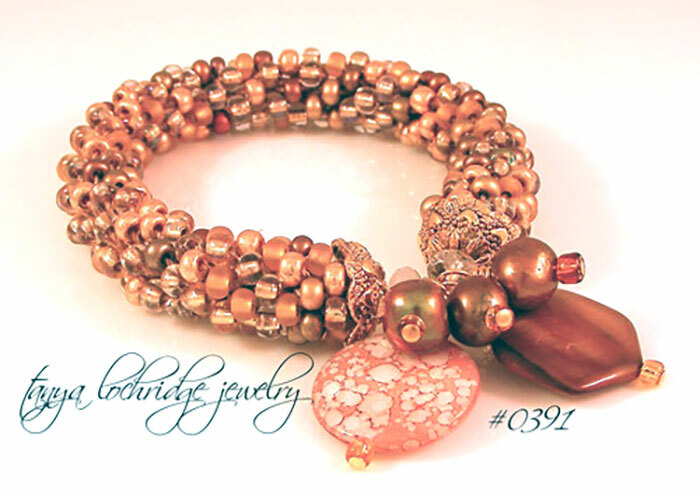 The rope part of the bracelet is made up of a mix of Czech glass gold and brown beads – some matte, some transparent, and others looking like magical gemstones. They are a perfect complement to the “charms” that dance from the rope. The unique soft bangle design of this bracelet means that you simply (and carefully) roll it over your hand and onto your wrist. Fits a medium sized wrist. This looks great layered with #0389 – the perfect way to start your collection. I love these soft bangle bracelets lstacked with metal bracelets from my jewelry box. Be creative, you can have a different look every day of the week. That’s the fun part. Think of this as your friendship bracelet all grown up and far more chic, right? Don't you think this would look fabulous on the Paige character of Royal Pains? And, unlike the friendship bracelets from camp, this style looks superb in the boardroom! Also, just so you know, the technique used to make the rope component of the bracelet is a variation of an ancient one used by the women in Nepal. And, I make each and every one of them in order to put my spin on the design. Handmade in the USA using domestic and imported components. 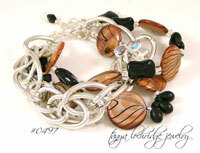 From the Tanya Lochridge Jewelry Trunk Show Collection.